Aliens, politicians, shyness, creationism, unworkable devices and more! Aliens and advancement - Did aliens teach proto-humans to evolve? Are American politicians really this stupid? - Apparently some conspiracy theorists are. God’s “shyness” makes ID hard to prove? - The Discovery Institute doesn’t see lack of evidence as a problem. The Missing Universe Museum - A slick cover can't hide the creationist agenda. 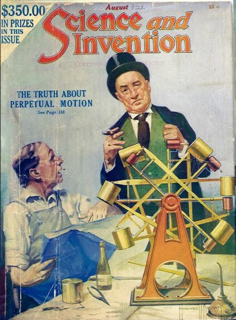 The Museum of Unworkable Devices: Perpetual motion machines as physics puzzles — Way back (WWW time) in the January 20th, 2008, issue of our Skeptic Summary, I chose as my pick, Donald Simanek’s Pages. Hopefully, whether because of my advice or not, you have been there. It’s a wonderful site, and rather vast. I still wholeheartedly recommend the site, and being that it has been years since that pick, I thought I would recommend it again, only this time with more focus on the section of the site that looks at perpetual motion machines. This is a museum of fascinating machines that can’t work along with the physics on why they can’t work, and even some puzzles and quizzes for those who want to delve deeper into the physics of where exactly the inventors have gone wrong. Production of useful work is limited by the laws of thermodynamics, but the production of useless work seems to be unlimited. Wednesday: Posh Skeptics started out discussing wine, while the more down-to-earth harped about boxed or Jack&Coke. Storm was greeted on her birthday, then we started talking music. And dreams. Weird dreams. But we don’t expect them to be normal, how could we when our minds are asleep which gives our brains free range on what to dream about… Someone mentioned Zoo, and the discussion immediately and inevitably turned to politics, and politics and creationism. We learned from Storm and Valiant Dancer there are many different spiritual paths in Wicca. After a gap in the chat-log, we discussed different aspects of what psi was defined as, and how they were named. A beast with human skin? 50 Popular Beliefs That People Think Are True, by Guy P. Harrison. “Maybe you know someone who swears by the reliability of psychics or who is in regular contact with angels. Or perhaps you’re trying to find a nice way of dissuading someone from wasting money on a homeopathy cure. Or you met someone at a party who insisted the Holocaust never happened or that no one ever walked on the moon. How do you find a gently persuasive way of steering people away from unfounded beliefs, bogus cures, conspiracy theories, and the like? Longtime skeptic Guy P. Harrison shows you how in this down-to-earth, entertaining exploration of commonly held extraordinary claims. God’s “shyness” makes ID hard to prove? There were 6,866 daily visitors this week.